Slices of crisp baked eggplant chips layered with feta cheese and smothered under tomato sauce. 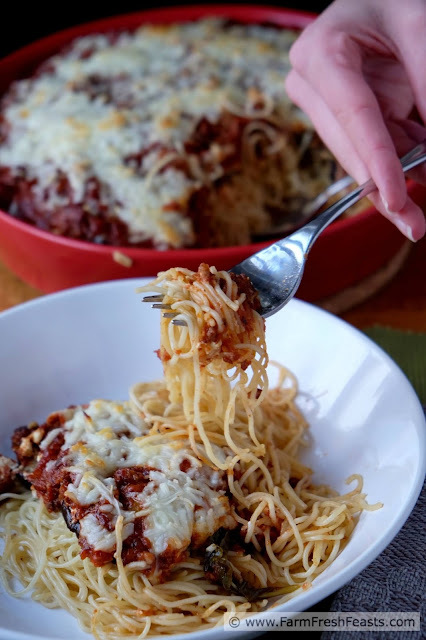 Served on a bed of spaghetti, this is a vegetarian casserole that will please the whole family. Sometimes I've got a lot on my mind. Sometimes I don't have much to say. This is one of the latter times. 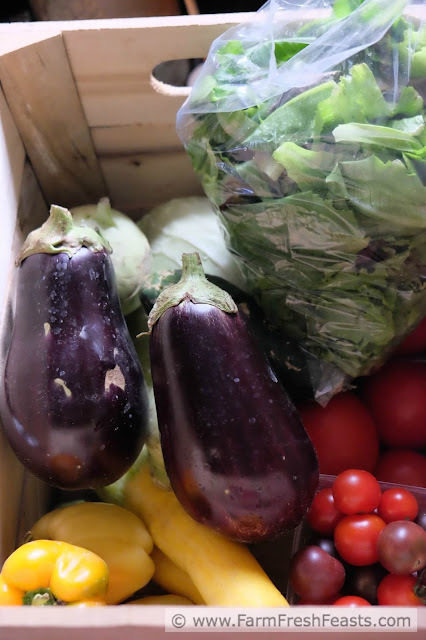 If you've been getting a lot of eggplant in your Community Supported Agriculture (CSA) farm share like I have, then you may be ready for a new idea without scrolling through a story. If the weather is turning a touch cooler in the evenings like it has been here, you may even be willing to turn on the oven. If you've got eggplant and you're willing to turn on the oven, this Baked Eggplant Chip recipe from our old CSA farmers of Blenheim Organic Gardens is a must try. I took it one step further and added a layer of feta cheese, because while living in Richmond, Virginia the Greek spaghetti from Texas Wisconsin Border Cafe was one of my favorite take out meals. I often throw a layer of feta between the noodles and the sauce on my plate when our family eats spaghetti just to recreate this memory. For other recipes using eggplant, please see my Eggplant Recipes Collection, part of the Visual Recipe Index by Ingredient, a resource for folks like me eating from the farm share. Preheat oven to 375 degrees Fahrenheit and prepare eggplant chips according to recipe above. As the chips are nearing the end of their 35-45 minute baking time, put a large pasta pot of salted water on to heat and prepare spaghetti according to package. If you like to use oil or non-stick spray, spray a 10 inch shallow round pan. As the pasta is finished, add drained spaghetti to the prepared pan. 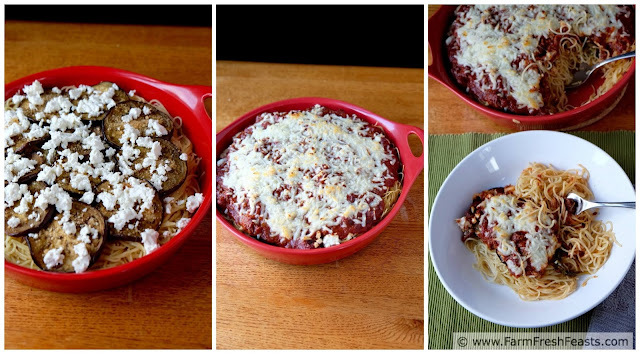 Top with eggplant chips, feta, spaghetti sauce, mozzarella and some parm cheese. Bake in preheated oven for 20-25 minutes until heated through and cheese is oozy. I've very glad to hear it! At pick up the other day a gal said she didn't want any more eggplant because she still had some from last week. Several of us were offering up suggestions (I want to try using long slices of eggplant in place of noodles in a lasagna). It's just too versatile. I love this --> simple, nutritious, and easily adaptable for any seasonal veggies! You made my morning! You're right, this would work great with slices of roasted winter squash, or grilled summer squash instead of the eggplant. Great idea--thanks! Kirsten, you had me with feta! 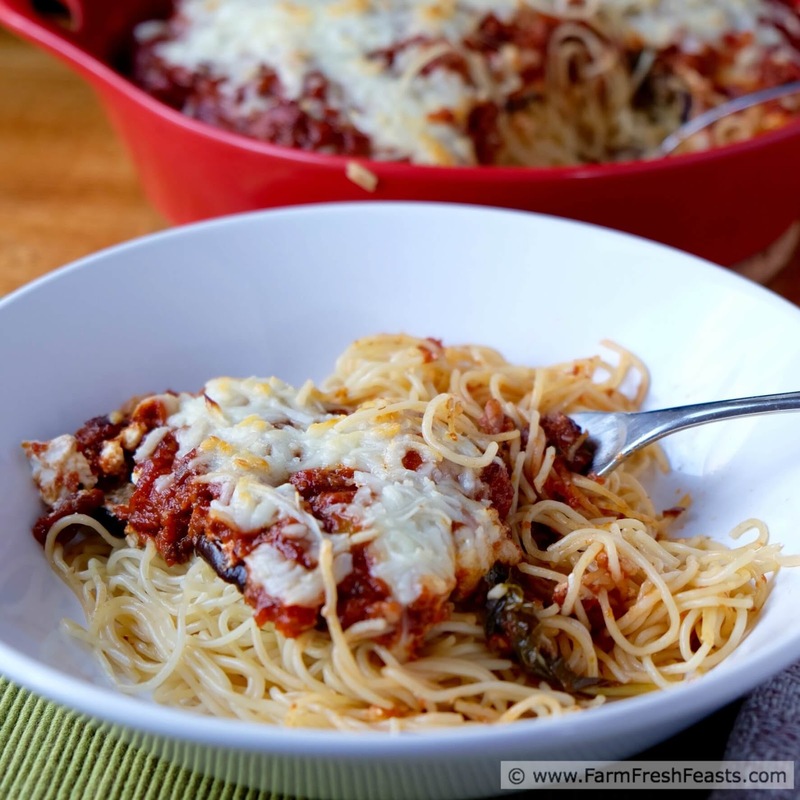 As you know, I love fresh CSA produce and this is a great way to use up eggplant! I was pretty pleased with how well the kids took to this casserole. I love both mozzarella and feta, but have to admit that I've never mixed them. Must try this. Plus if it has spaghetti, I'm there! Sheep and cattle don't mix (old Far Side cartoon) but mozzarella and feta? You bet. Such a rustic delicious looking combo - I want to try this! !